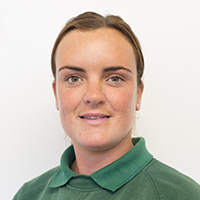 I am 26 years of age I have been working at Vermuyden veterinary practice for 10 years, started by having my work placement here then was offered a Saturday job whilst I was still at school then when I left I started full time. I have 2 dogs both rescued and 2 horses. Out of work I spend most of my time with my horses by competing them to a high level in the show ring.